Celtic Park has been the home of Celtic since 1892, when the club moved away from a nearby ground that was also called Celtic Park following a dispute over the rent. 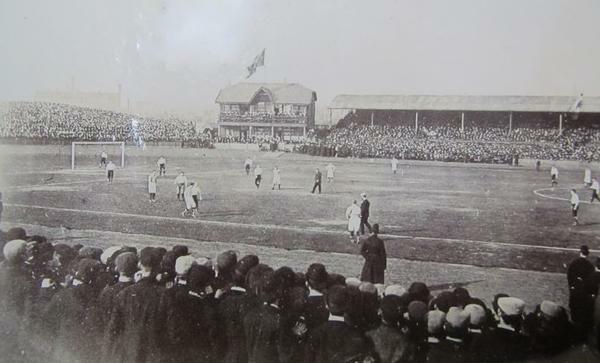 Celtic Park officially opened on the 13th of August 1892 with the club’s annual sports day. The first match was played a week later and saw Celtic beat Renton 4-3. 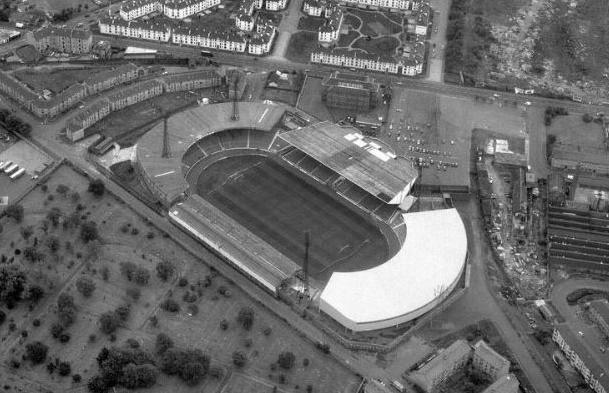 The stadium was initially oval-shaped with cycling track, pavilion, and one wooden stand at the Janefield Street side. Four years later, in 1898, a new grand stand was built on the other side. This was the first ever double-decker stand at a football ground and lifted capacity to over 50,000. 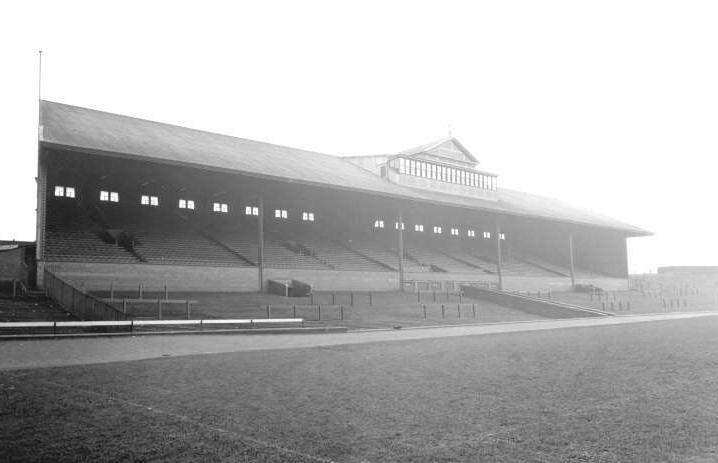 In 1904, the wooden Janefield Street Stand burned down and got replaced by a covered terrace, which would go by the name “The Hayshed”. In 1927, it was the turn of the double-decker Grand Stand to burn down, which got replaced in 1929 by a new Main Stand designed by Archibald Leitch. While the construction of the new Main Stand was still in progress, another fire engulfed the pavilion. No further changes were made in the following decades. 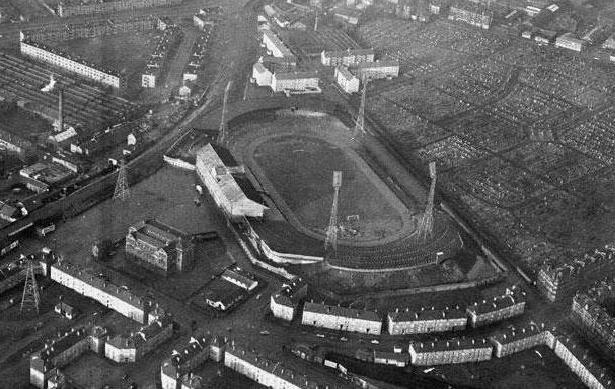 Celtic Park set its unofficial record attendances in 1938 when 92,000 spectators came to see the Old Firm. 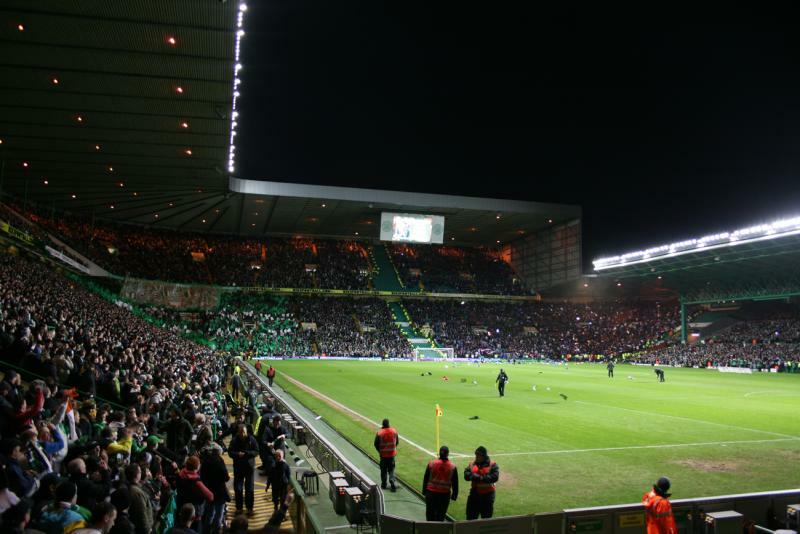 Official attendances never were higher than 80,000, Celtic Park’s maximum capacity. 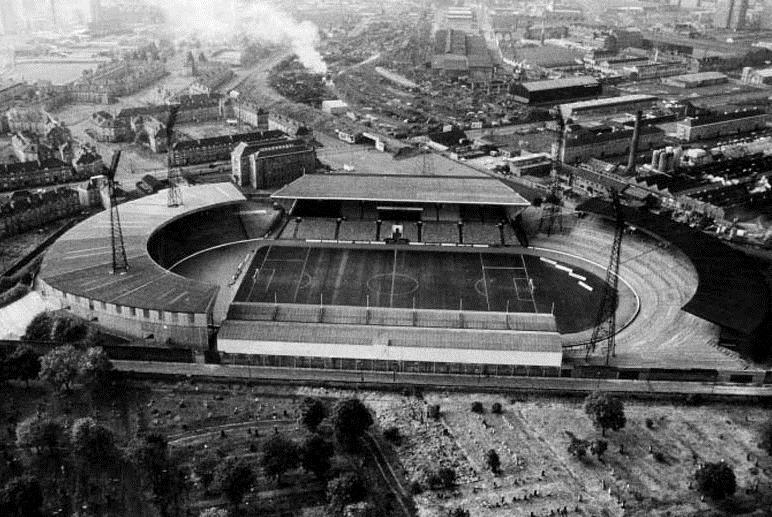 In 1957, the Celtic End received (partial) cover, and almost a decade later, in 1966, the Hayshed terrace received a new roof. In those times, the terrace was commonly referred to as “The Jungle”, because of its poor state and fanatic fans. 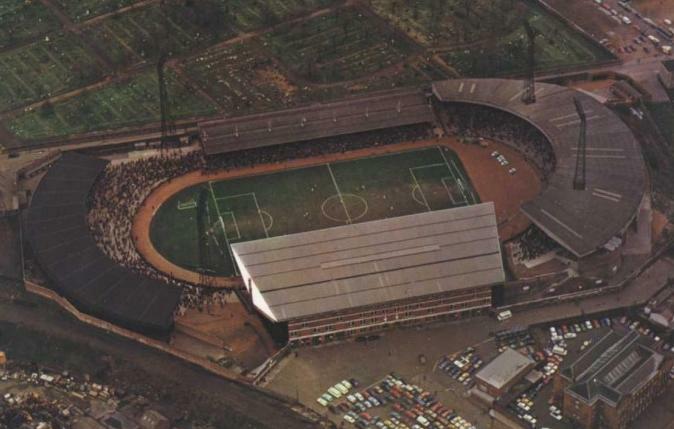 In the late 1960s the Rangers End also received cover, and shortly after the Main Stand got extensively refurbished, including a new roof. Capacity got reduced to 60,000 due to safety measures following the Ibrox disaster. 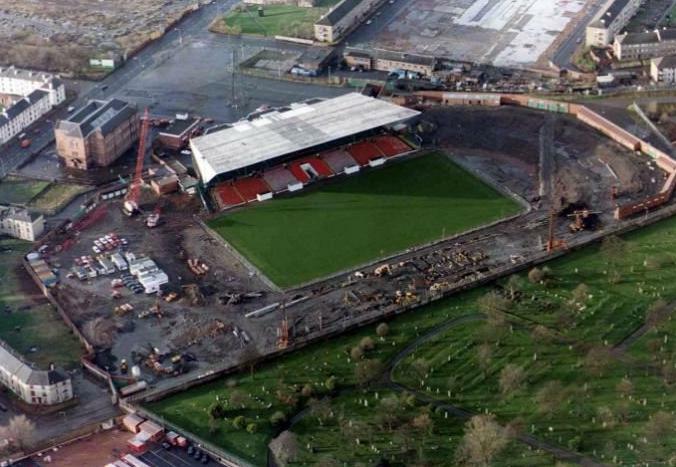 Due to the precarious financial situation of Celtic in the 1980s and early 1990s, no further changes were made to Celtic Park until the take-over of Fergus McCann in 1994. Funds were raised through a share issue, and a large redevelopment project was started. 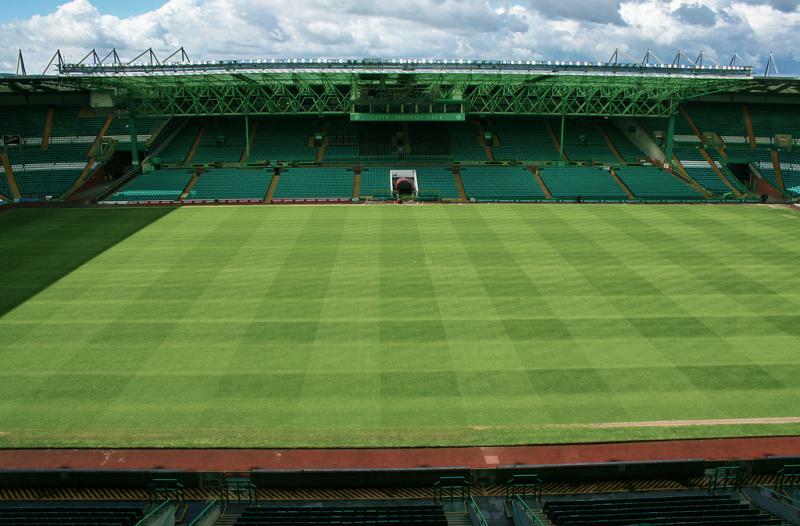 As this involved the demolition of both ends and the Jungle, Celtic was forced to play its 1994/95 home matches at Hampden Park. 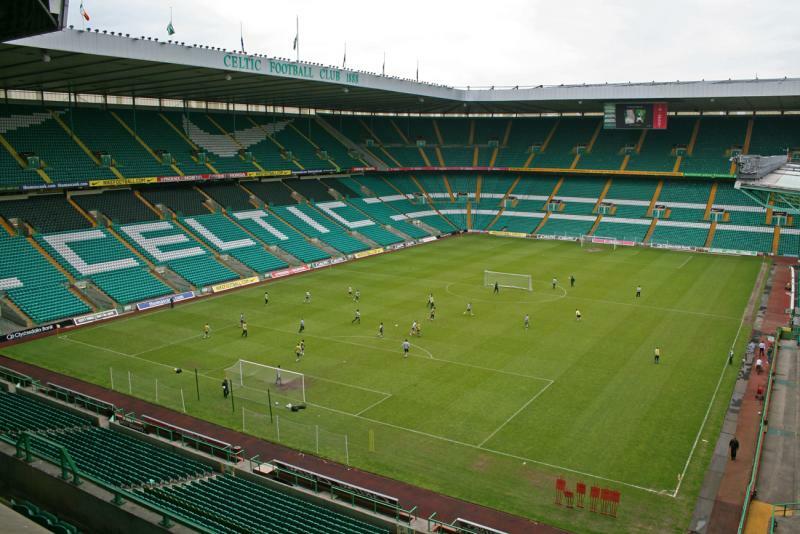 Celtic Park reopened in 1995 with a newly built North Stand. Works continued on both ends, which were were completed in August 1998. 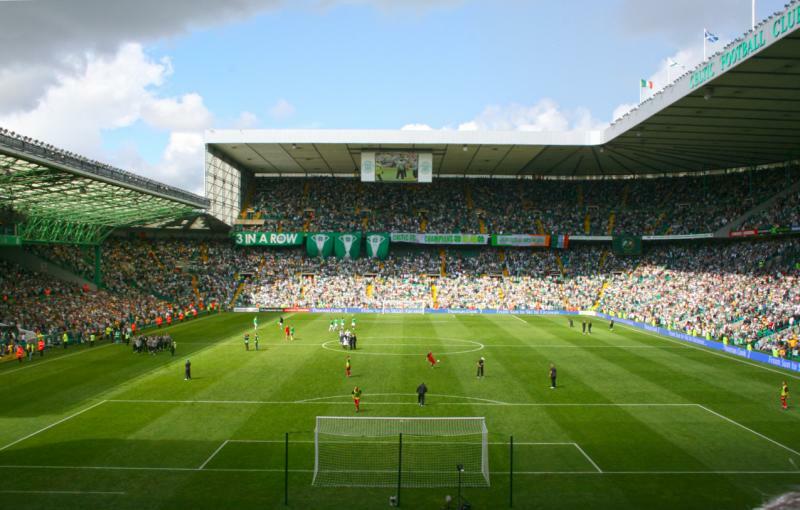 Celtic fans have used both Parkhead and Paradise as nicknames for Celtic Park. 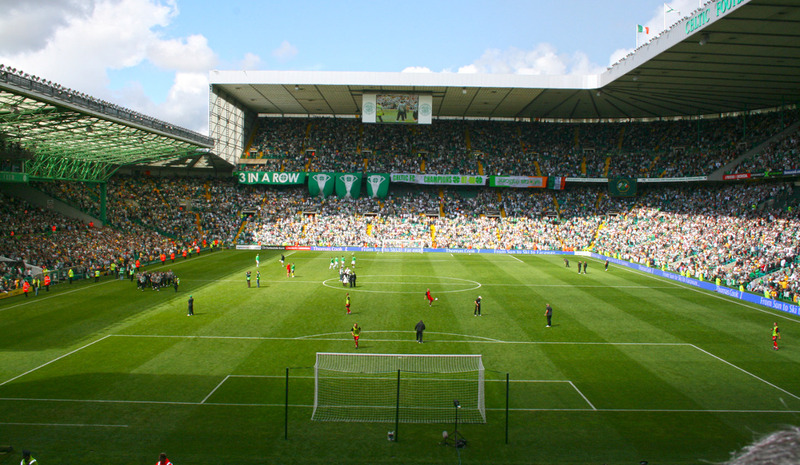 Celtic Park is located about two miles east of Glasgow’s city centre in the Parkhead area. 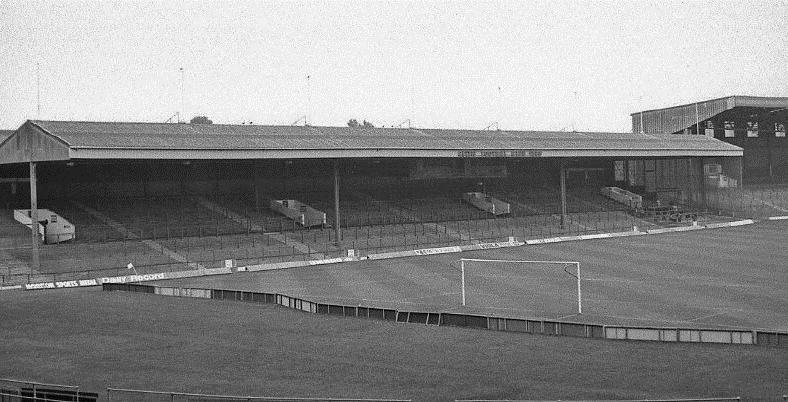 The stadium lies on London Road. Exiting the M74 at Tollcross, and then following London Road west for almost 2 miles brings you to the stadium. Continuing on London Road further west brings you to Glasgow’s city centre. If coming from the M8, exit at junction 14, and drive down south on Alexandra Park Street until reaching London Road. Turn left onto London Road and follow until you reach the stadium on your left. Buses 43 and 64 bring you from the city centre to the ground. Take the bus on Ingram Street, and get off on London Road. Both buses run about every half an hour, and the journey takes 30 minutes. Buses 61 and 62 pass the stadium on Gallowgate Road, just slightly further away. Both leave from Glasgow’s Central Rail station. Alternatively, one can take a train from Glasgow Central to Dalmarnock or Bridgeton rail stations (5-minute journey). Both stations lie about 10 to 15 minutes walking from Celtic Park. From Glasgow Queen Street trains regularly depart for Bellgrove or Carntyne. The journey takes 5 minutes as well, but the walk to the stadium slightly longer (20 to 30 minutes). Celtic Park is located in a rather bare area which is a mix of some old industrial buildings and residential housing. There are a few pubs, most around Gallowgate north of the stadium, but eating and drinking in Glasgow’s city centre is likely a better option. The Merchant City area in the east of the centre is conveniently located for drinking. From there you can catch a bus or train (Argyle Street), or even walk to the stadium. Other nightlife areas are around Sauchiehall Street and Bath Street in the city centre, or in the West End. There are no hotels near Celtic Park, but a good few in the Merchant City area. The Brunswick Merchant City Hotel, Mercure Hotel, Rab Ha’s, and Holiday Inn Express are all affordable options that get good reviews. Click here for all hotels in the Merchant City area, and here for all hotels in central Glasgow. If you arrive by car, the Premier Inn at the exit off the M74 may be an alternative. It can even (just) be walked from to the stadium. 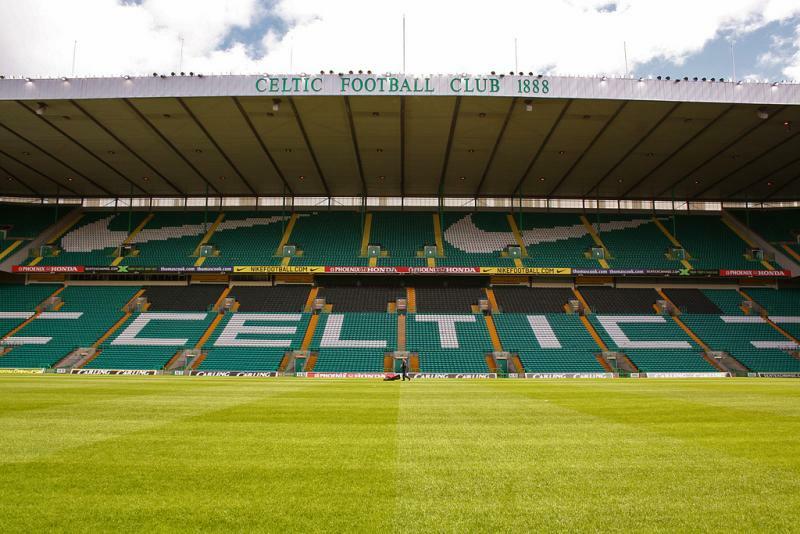 Tickets for Celtic FC matches can be purchased online, by phone +44 (0) 871 226 1888, in person at the Celtic Ticket Office at the stadium, or at one of the selected retail outlets (e.g. on Sauchiehall Street or Argyle Street). On the day of the match the Celtic Ticket Office is opened until kick-off. In recent years attendances at Celtic matches have slightly dropped, and tickets will be easily available for most regular league matches. Tickets cost £26.00 for all stands except some central seats at the Main Stand, which cost £31.00. Some seats with restricted view go for a little less. You can find a seating plan here. For more information call +44 (0) 871 226 1888 or email homematches@celticfc.co.uk. 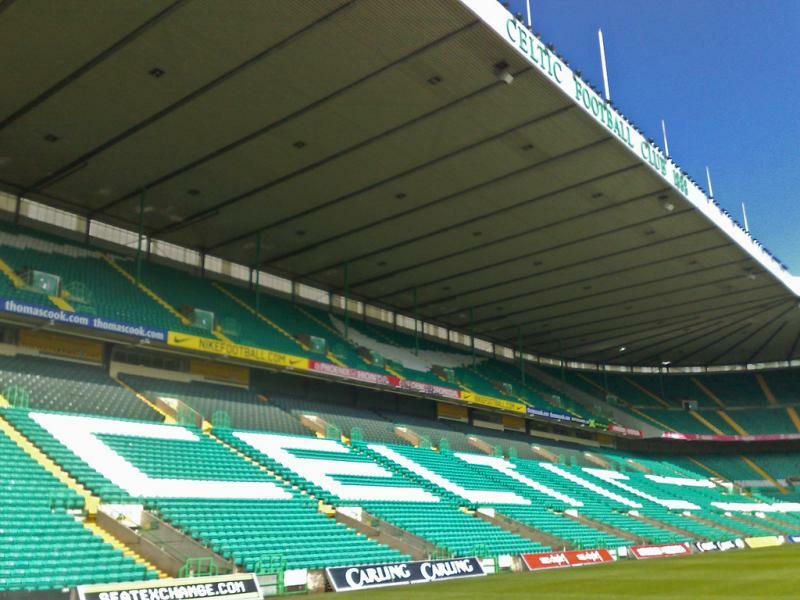 Celtic offer guided stadium tours around Celtic Park that last about 90 minutes. On matchdays there are tours that last 60 minutes. Tours leave every day of the week at 11:00 am, 12 noon, 1:45 pm, and 2:30 pm. On Saturday matchdays tours leave at 9:30 am, 10:00 am, 10:30 am, and 11:00 am. On non-Saturday matchdays there are no tours. The tour costs £8.50. Bookings are not necessary, but highly advised and can be made by calling +44 (0) 871 226 1888 or emailing stadiumtours@celticfc.co.uk. Celticfc.net – Official website of Celtic FC. SeeGlasgow.com – Official guide to metropolitan Glasgow. Firstgroup.com – Information about bus timetables and fares. I went for a tour of Celtic park on 24/3/2015 with 2 resedents from the care home I work in and we enjoyed it so much we also got to meet Bertie auld and john Clark who were both very nice which was great for the resedents they came away very happy and when we got back to the home they couldn’t stop talking about it so I would like to thank everyone at Celtic park for a great day and not forgetting the lady that gave us the tour she was very nice and friendly so once again a big thank you keep up the good work. I think it is a great Stadium with a nice atmosphere. Celtic fans are very loud. Tickets are available online and at the gate. Very pleased with my visit there. I visited Parkhead a few years ago with my son,who had bought the tickets to see a game against our own team,Falkirk. I appreciate they were within his price range, but when we finally located our “seats” at the top of the stand. they weren’t there! The supports were there, but nothing to sit on. AND the metal upright obscured our view of the goal. I vowed never to return, but unfortunately with Hampden being out of action, Scotland are playing some games there this year. It’s a question of going to the games and ignoring the venue. Perhaps by now the powers that be won’t have the brass neck to sell tickets for seats that don’t exist. Enjoyed my Celtic experience today and the price for the tour is fantastic but can I point out a few facts without being offencive. I had 2 young children with me and although they got in for free (although I wouldn’t have minded paying ) I think to make it a wee bit more exciting for them they should have received a goody bag with maybe an autograph of favourite player and a pencil,rubber or so. Or even a drink of juice or something as we weren’t allowed to take our own in. And Maybe a player to speak a few words of wisdom to the kids. After all children are our future of the next football generation. Just think more thought could go into the tour as us Celtic supporters do spend a lot of money on their merchandise. aye, when I was but a wee lad I went to Paradise with me mum. we had nary a penny between us, so we had to peek through the gates to watch. Oh, how I remember watching the great Babe kicking the fannies of the English that fine day, how the fire of the crowd burned in my heart for the rest of me youth. Twas good times, they wot. Went to the stadium to see the Champion League game between Celtic and Barça on 7/11/2012. That day the club was founded 125 years ago. Never saw anything like it, the Celtic fans were awesome ! Respect from a Barça supporter !